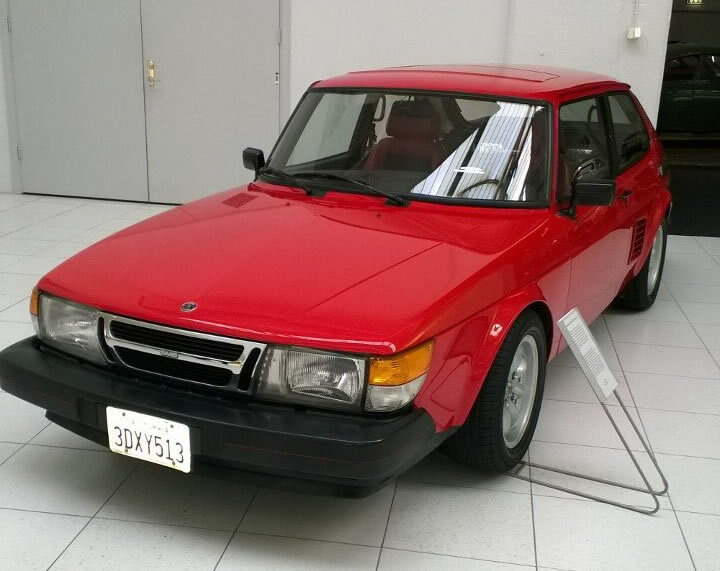 Anybody who looks at Ove Hasselberg’s Saab 900 can’t help noticing its European-market headlights and its mean stance, highlighted by attractive Minilite wheels wearing meaty Pirelli tires. But when Hasselberg romps on the throttle and leaves the scene, it takes a keen eye to notice something peculiar: His Saab squats like a Porsche 911, its rear wheels displaying noticeable negative camber with each shift. Saab 900s aren’t supposed to do that. 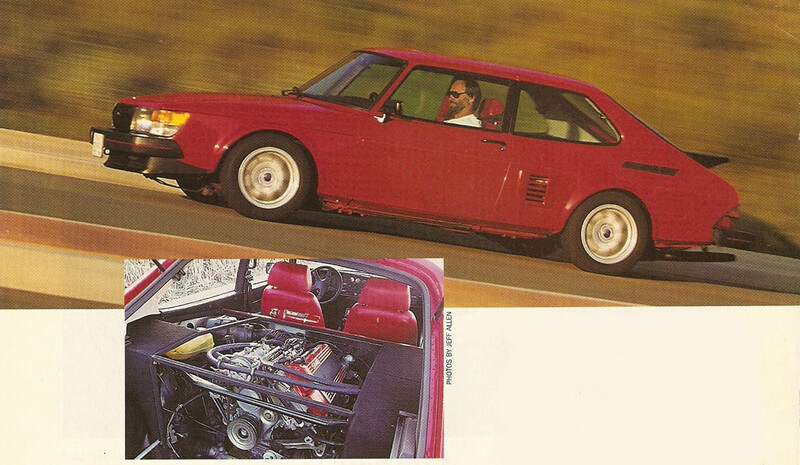 Well, as you may have guessed, this is no ordinary Saab 900. 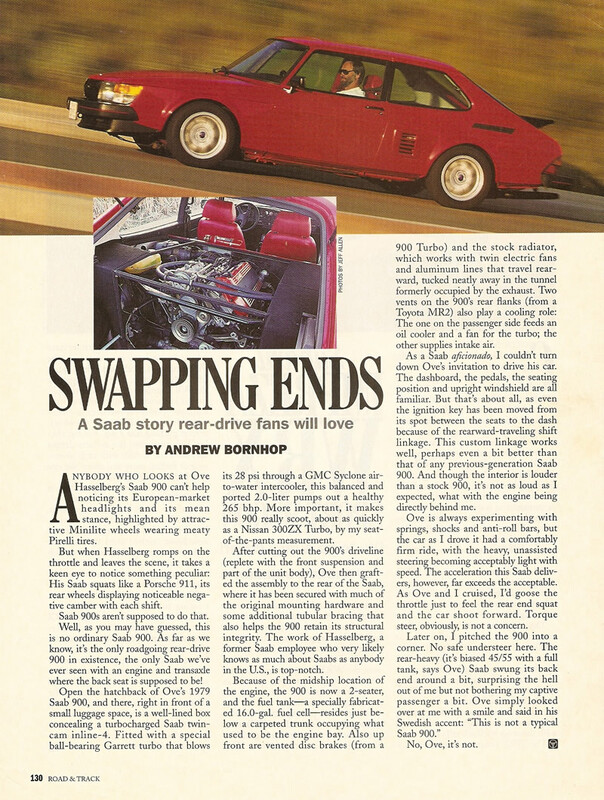 As far as we know, it is the only roadgoing rear-drive 900 in existence, the only Saab we’ve ever seen with an engine and transaxle where the backseat is supposed to be! Open the hatchback of Ove’s 1979 Saab 900 and there, right in front of a small luggage space, is a well-lined box concealing a turbocharged Saab twin-cam inline-4. Fitted with a special ball-bearing Garrett turbo that blows its 28 psi through a GMC Syclone air-to-water cooler, this balanced and ported 2.0-liter pumps out a healthy 265 bhp. More important, it makes this 900 really scoot, about as quickly as a 300ZX Turbo, by my seat-of-the-pants measurement. After cutting out the 900’s driveline (replete with the front suspension and part of the unit body), Ove then grafted the assembly to the rear of the Saab, where it has been secured with much of the original mounting hardware and some additional tubular bracing that also helps the 900 retain its structural integrity. The work of Hasselberg, a former Saab employee who very likely knows as much about Saabs as anybody in the US, is top-notch. Because the mid-ship section location of the engine, the 900 is now a 2-seater, and the fuel tank – a specially fabricated 16.0-gal fuel cell – resides just below a carpeted trunk occupying what used to be the engine bay. Also up front are vented disc brakes (from a 900 Turbo) and the stock radiator, which works with twin-electric fans and aluminum lines that travel rear-ward, tucked neatly away in the tunnel formerly occupied by the exhaust. Two vents on the 900’s rear flanks (from a Toyota MR2) also play a cooling role: The one on the passenger side feeds an oil cooler and a fan for the turbo; the other supplies intake air. As a Saab aficionado, I couldn’t turn down Ove’s invitation to drive this car. The dashboard, the pedals, the seating position and upright windshield are all familiar. But that’s about all, even the ignition key has been moved from its spot between the seats to the dash because of the rearward-traveling shift linkage. This custom linkage works well, perhaps even better than that of any previous generation Saab 900. And though the interior is louder than a stock 900, it’s not as loud as I expected, with the engine directly behind me. Ove is always experimenting with springs, shocks and anti-roll bars, but the car as I drove it had a comfortably firm ride, with the heavy unassisted steering becoming acceptably light with speed. The acceleration this Saab delivers, however, far exceeds the acceptable. As Ove and I cruised, I’d goose the throttle just to feel the rear-end squat and the car shoot forward. Torque steer, obviously is not a concern. Later on, I pitched the 900 into a corner. No safe understeer here. The rear-heavy (it’s biased 45/55 with a full tank, says Ove) Saab swung its back end around a bit, surprising the hell out of me but not bothering my captive passenger a bit. Ove simply looked over at me with a smile and said in his Swedish accent: “This is not a typical Saab 900.” No, Ove, it is not. This has always been one of my favorite 900 articles. Anyone habe an idea where Ove and the car are now? I’d like to see more pictures. Certainly makes changing the belts easier! That has to sound blissfull when driving it…. lol Neat for sure – but not something you could really drive everyday. Very sweet! I could get my red 900 to that “wet lipstick” look if I compounded, polished and buffed for a week. That was the car that I fitted the slightly oversize tires and wheels from that Saab entry that did the “Lap of America” on. Are those US tags on it? They look very “New Jersey” to me? Saabhat93: As far as I know both Ove and the car are back in Sweden. I saw the car and spoke to him at Kinnekulle Ring racetrack in connection with the 2015 Saab Festival in Trollhättan, Sweden. The car is still in great condition! My first reaction was that the side vents looked quite rice. But looking closer there were something about what I could see from the rear suspension that looked wrong but still very familiar. Then I realized it was the front A-arms, and that the big box in the rear was not a subwoofer but the engine cover! After that I had no issue with the side vents any more. I like FWD, definitely has many benefits especially in winter. But sometimes I wonder what my 2005 Saab 9-5 would drive like with 250hp on the rear wheels. And if it would have changed how Saab was viewed compared to BMW and Mercedes-Benz.